Practically all the projects related to manned flights to the moon are absent from an updated version of the Federal Space Programme for the years 2016 through 2025 drafted by the Federal Space Agency after the downwards revision of its budget, Izvestia daily said on Tuesday referring to the document it had obtained. "As it follows from the text of the draft programme, which Roscosmos has submitted to the government for review, a decision was taken to sacrifice the lunar programme that was named a strategic goal for future development of Russian space research," the newspaper said. "Compared with the version of the programme, which Roscosmos presented in April 2015, the creation of a lunar landing/takeoff complex, a lunar orbital station, construction of a lunar base, the designing of a spacesuit for operations on the Moon, and designing of a system for robotic maintenance on the moon have been removed from the list of financed programmes," it said. However, works continue on a spaceship that might make flights to the Moon in the future. 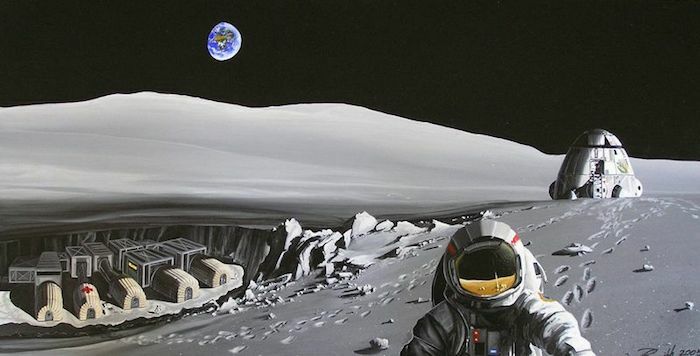 Deputy Prime Minister Dmitry Rogozin, who supervises the aerospace industry in the government, said in April 2014 Russia was eyeing colonization of the Moon. On Monday, President Putin signed a decree on disbanding the Federal State Agency that will be replaced with a state space corporation. The same presidential decree instructed the government "to ensure the continuity of powers of and functions transferred to the State Corporation for Space Activity Roscosmos from the Federal Space Agency. ".